-Built-in microprocessor chip, with the intelligent functions of automatic calibration, automatic temperature compensation, data storage, function setting and automatic self-diagnose, auto power off and low voltage display etc. -Adopts digital filter and step slipping technology to intelligently improve meter's response speed and result accuracy. " "will appear when reading to be stable. - Automatically recognize 13 kinds of pH standard buffer solution. User can choose anyone from three series of buffer solutions: Europe & U.S.A. series, NIST series, China series. -Purified water and ammonia added purified water pH measuring mode can be set up, especially suitable for the fields of electric power and petrochemical etc. -Meter's circuit board adopts SMT film-covering technology to improve meter's production reliability. -Meter has the back light LCD display monitor. -Dustproof and waterproof meter meets IP57 rating. 1. 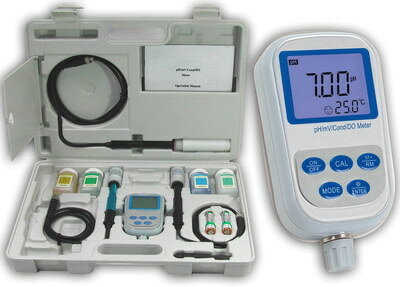 Double parameters meter, with pH and DO electrode, also with calibration solution and special carrying case, easy to use. 2. Built-in microprocessor chip, with the intelligent functions of automatic calibration, automatic temperature compensation, data storage, function setting and automatic self-diagnose, auto power off and low voltage display etc. 3. Adopts digital filter and step slipping technology to intelligently improve meter's response speed and result accuracy. " " will appear when reading to be stable. 4. 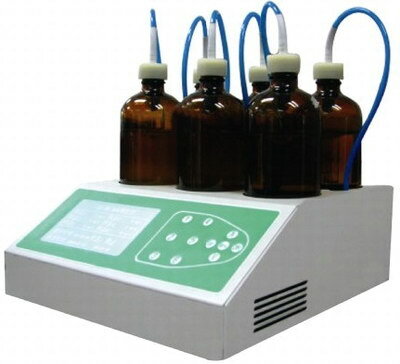 It automatically recognizes 13 kinds of pH standard buffer solution. User can choose anyone from three series of buffer solutions: Europe & U.S.A. series, NIST series and China series. 5. Purified water and ammonia added purified water pH measuring mode can be set up, for this two special pH measuring modes, besides the general slope compensation, also added function of nonlinearity temperature compensation for pH values of solution to make measurement more accurate, especially suitable for use in the fields of electric power and petrochemical etc. 6. Equipped with new type of DO electrode with temperature and salinity sensor which makes DO measuring mode has auto temperature compensation, auto salinity compensation and manual barometric pressure compensation. It's easy to use and accurate to measure. 7. Polarogram type DO electrode has special electrode calibration cap. Only needs 3 to 5 minutes for electrode polarization. Electrode adopts combination diaphragm cap which very convenient to use. Each DO electrode equips with three spare diaphragms caps. 8. Meter's circuit board adopts SMT film-covering technology to improve meter's production reliability. 9. Meter has the blue back light LCD display monitor. 10. Dustproof and waterproof meter meets IP57 rating. 1. 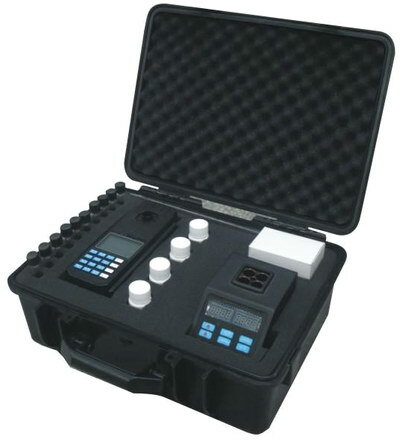 Double parameters meter, equipped with conductivity electrode, DO electrode, calibration solution and special carrying case, easy to use. 2. Built-in microprocessor chip. Its features up to functions of automatic calibration, automatic temperature compensation, data storage, function stting, auto power off and low voltage indication etc. 4. Adopts advanced automatic frequency convertible and voltage regulation technology to enlarge the measuring range 10 times for conductivity electrode which constant K=1. It can meet measuring accuracy requirement for range within 0 to 200mS/cm by using only one-point calibration. It is the particular one�Cpoint calibration function for this meter. 5. It automatically recognizes 8 kinds of conductivity standard solution. User can choose anyone from two series of standard solutions: Europe & USA series and China series. 6. Automatically select conductivity measuring range, the meter will do non-linearity temperature compensation test for purified and high purified water less than 10 uS/cm, which greatly improve the measuring accuracy. It is especially suitable for use in fields of electric power, microelectronics and medicine. 7. Equips new type of DO electrode with temperature and salinity sensor which has function of automatic temperature compensation and automatic salinity compensation as well as manual barometric pressure compensation inside meter, easy to use, accurate to measure. 8. Polarogram type DO electrode has special electrode calibration cap. Only needs 3 to 5 minutes for electrode polarization. Electrode adopts combination diaphragm cap which very convenient to use. Each DO electrode equips with three spare diaphragms caps. 9. Meter's circuit board adopts SMT film-covering technology to improve meter's production reliability. 10. Meter has the blue backlight LCD display. 11. Dustproof and waterproof meter meets IP57 rating. Extech DO700 is OEM made based on ours this meter SR736. They use totally same IC borard and shell, and technology to produce. electrode, when connect the electrode to the meter, the meter can automatically know the electrode, easy to use. 2. Built-in microprocessor chip.. Its features up to automatic calibration, automatic temperature compensation, data storage, auto power off, low voltage indication, functions setting and automatic self-diagnose etc. 4. Automatically recognize 13 kinds of pH standard buffer solution. User can choose anyone from three series of buffer solutions: Europe & U.S.A. series, NIST series, and China series. 5. High purified water and ammonia added purified water pH measuring mode can be set up, for this two special pH measuring modes, besides the general slope temperature compensation, also added function of nonlinearity solution temperature compensation to make measurement more accurate, especially suitable for the fields of electric power and petrochemical etc. 6. Adopts advanced automatic frequency convertible and voltage regulation technology to enlarge the measuring range of conductivity electrode which constant K=1 to 10 times. It can meet measuring accuracy requirement for range within 0 to 200mS/cm by using only one-point calibration. 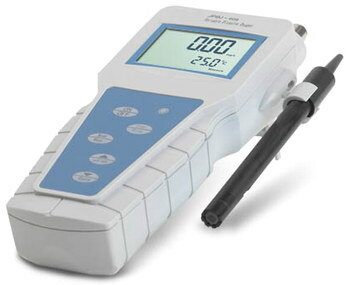 It is the particular one�Cpoint calibration function for this meter. 7. Automatically recognize 8 kinds of conductivity standard solution. User can choose anyone from two series of standard solutions: Europe & USA series and CHINA series. 8. Automatically select conductivity measuring range, the meter will do non-linearity temperature compensation test for purified and high purified water less than 10uS/cm, which greatly improve the measuring accuracy. It is especially suitable for use in fields of electric power, microelectronics and medicine. 9. Equips new type of DO electrode with temperature and salinity sensor which has function of automatic temperature compensation and automatic salinity compensation as well as manual Atmospheric pressure compensation inside meter, easy to use, accurate to measure. 10. Polarogram type DO electrode has special electrode calibration cap. Only needs 3 to 5 minutes for electrode polarization. Electrode adopts combination diaphragm cap which very convenient to use. Each DO electrode equips with three spare diaphragms caps. 11. Meter's circuit board adopts SMT film-covering technology to improve meter's production reliability. 12. Meter has the back light LCD display monitor. 13. Dustproof and waterproof meter meets IP57 rating. 3. Response time: ≤30s (90% response at 20.0ºC). 2. 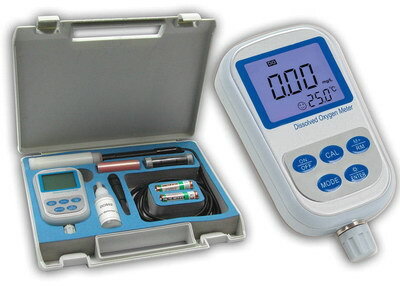 Measuring D. O. concentration, saturation, electrode current and temperature; With the functions of automatic temperature compensation and calibration of zero oxygen, full scale, atmosphere pressure and salinity. 3. The meter has the function of protection from electricity cutting off. With Measuring results can be stored, deleted, viewed and printed. At most 250 sets of data can be stored. 6. With RS-232 interface which is connected and with Model TP-16 printer to print measuring results or connected with computer to communicate. 8. The electrode system is composed of polarographic oxygen electrode and temperature electrode. 2. Automatic temperature compensation range: (0.0~40.0) ºC. 4. Repeatability of the meter: ≤0.2mg/L. 5. Stability of the meter: not over ±0.2mg/L within one hour. 7. Response time ≤20s (90% response at 20.0ºC). 8. Salinity calibrating range: (0.0~40.0)g/L. 1 or 2 points auto-calibration (100% in saturated air or air-saturated water, 0% in zero oxygen solution). Automatically compensates salinity and barometric pressure after manual input. Selectable readout in ppm, mg/L or % saturation. Selectable either temperature units between degrees Celsius (°C) and degrees Fahrenheit (°F). Automatic Temperature Compensation ensures high accuracy of measurements. 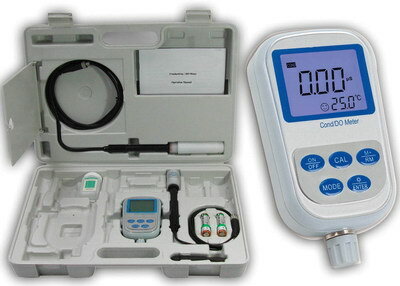 Setup menu lets user customize calibration points, temperature units, date and time to meet measurement requirements. Stored data can be transferred into computer via USB communication interface. 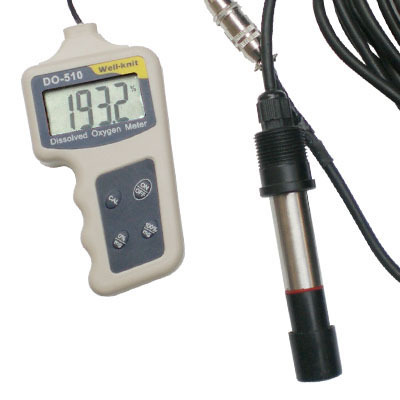 PHS980 is professional dissolved oxygen meter designed for laboratory applications. 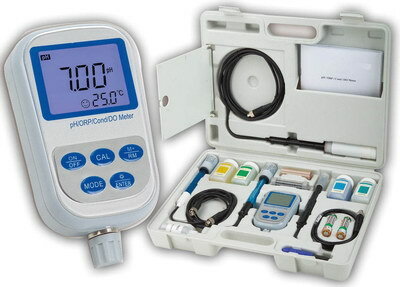 The meter is equipped with a polarographic sensor for measurement of dissolved oxygen concentration or percent saturation in water. - The worthy lab dissolved oxygen meter for its good performance and low cost. - New type dissolved oxygen electrode has function of salinity measurement, can automatic achieve salinity compensation and temperature compensation; Meter inside with air pressure sensor, can automatic achieve air pressure compensation. - PolarograPHic type dissolved oxygen electrode, short polarization time, fast response and accurate measurement. - Convenient used dissolved oxygen electrode calibration cover and combined type diaPHragm cap. - Meter meets with the requirement of international GLP standards. It features up to automatic calibration, automatic temperature compensation, storage data, clock display, time measurement, RS232 output, functions setting and self-diagnose information etc. - It adopts digital filter and step slipping technology to improve meter's response speed and repeatability. - Dustproof and waterproof meter meets IP54 standards. *Three reading modes to meet different customer measuring needs. (Smart-Read mode, Continuous-Read mode, Timed-Read mode). 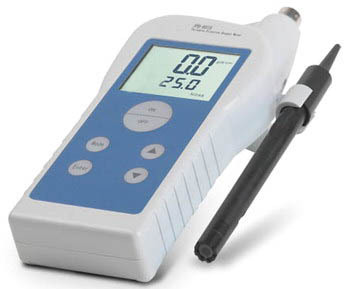 *More accuracy measurement with reminder the electrode performance and calibration. *Auto upgrade hardware: Complete and simple user’s operation. *Support GLP norm: More complete checking the stored information. 1) The meter requires setting operator No and records the all operating procedures. 2) It can record, view and print calibration data. 3) It can store measuring data(500 sets) which follows GLP norm. 4) Support view, print, delete stored data. *Large and light screen: displaying measurement value, temperature value, constant, measurement mode, operation date and time. *Auto zero oxygen calibration and full scale calibration. *Support barometric pressure calibration and salinity calibration. *Supports the function of power-off protection, protect your data. This product is the use of sealed catalytic digestion, and then colorimetric measurements. The instrument uses advanced, narrowband interference technology and microcomputer automatic processing of data, direct display. The instrument is widely used in environmental monitoring, wastewater treatment and universities, research institutes and other departments. 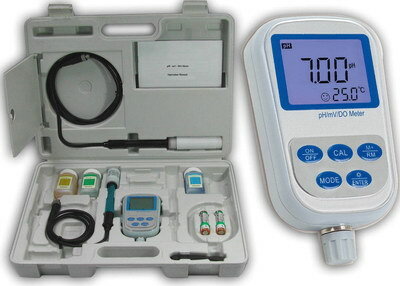 ●Analyzer apart with digestion device, does not affect measurement accuracy. PID automatic temperature control, automatic timing. ●High-performance ultra-low power 16-bit microcontroller, standby time of the instrument is up to six months or more. ●Operation save time, COD digestion just 10min. ●Cold light, narrowband interference optical system, good optical stability. ●With a USB port, you can join the computer to record read. ●LCD large-screen LCD for easy and intuitive operation. ●Host chassis with molded ABS material, IP65 design, waterproof and dustproof performance. ●With calibration tube function, eliminating the optical differences digestion tubes, to ensure accuracy. ●Optional printing function and emergency backup battery. Measurement range: COD: 5 ~ 2000mg/L, exceeding the dilution determined. (4). no significant vibration and electromagnetic interference, avoid direct sunlight. Host 1set, digestion device 1set, carrying case 1piece, digestion colorimetric tube 20pieces, test tube rack 1piece, COD reagent 1set, AC-DC converters (220V/12V) 1piece, car power adapter 1piece, digestion shield 1piece, manual 1piece, product certification 1piece, warranty card 1piece. 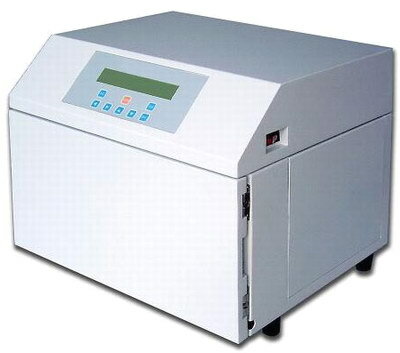 * It adopts dichromate colorimetric method. * Direct reading of COD results and no need to analyze by other means such as titration. * Measuring results can be viewed, deleted and printed. Up to 200 sets of measuring data can be stored and it can be connected with TP-16 printer. * It adopts digestion method of sealing reflux and can conduct simultaneous digestion of 21 samples for low energy consumption. * The digestion temperature can be adjusted from ambient temperature to 165ºC. Also, it is equipped with over temperature alarming system. * The digestion time can be set from 0 to 120 min. It will be power off after response. Apply to Surface Water, Sewage, and Industrial Wastewater in the BOD. Biochemical oxygen demand BOD value on the screen. ● Exchangeable microbe electrode units make operation smoother and less time-consuming than loading and replacing conventional membranes. ● Once mounted, electrode units may be used immediately. ● Front panel allows simple, pushbutton operation. ● Compact size, taking up little space. ● Ease of replacement by installing electrode units or tubing into the opened door in the front panel. ● Anti-reflux valves and antibacterial tubing reduce the frequency of maintenance. ● Bacteriostatic is mixed into standard and buffer solutions, so measurements are stable over the long term. ● Measurements in regions of low concentration are especially stable. ● High correlation with officially certified methods. 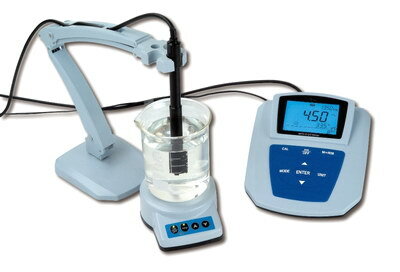 ● Changing pump rpm or sample contact time allows measurements in regions of high concentration. ● The optional microbe fixation kit enables the use of other microbes and, therefore ,a variety of water samples. ● Making no use of dangerous reagents and emitting no harmful effluents, the Quick BOD SRB-I is environmentally friendly. ● Used electrode units are recovered with a dedicated shipping and recovery box, and replacement electrode units are shipped with the same dedicated box. Determination applies to surface water and domestic sewage, industrial effluents in the BOD. An oxygen electrode monitors the change in respiratory action caused by the consuming of organic matter by bacteria. The bacteria (trichosporon cutaneum) are incorporated into the oxygen electrode. When a solution containing organic matter is fed to the microbe electrode sensor, the microbes ingest the organic matter, increasing respiratory action and in turn the consumption of oxygen. The amount of oxygen passing through the microbe membrane decreases resulting in a change in the current, which is output by the dissolved oxygen electrode. This change corresponds to the concentration of organic matter. The Quick BOD SRB-1 takes significant steps to do away with the weaknesses of biosensor BOD measuring apparatus entailed by trouble and time required to replace and load microbe membrane and，with an exchangeable electrode unit that makes it easy to use right away，provides improved operability and maintainability standard and buffer bacteriostatic solutions and antibacterial tubing allow stable measurements over the long term. The dedicated shipping and recovery box for Used and replacement electrode units may be reused any number of times and the exclusion of apparatus environmentally friendly and easy to use . Apparatus for the estimation of biochemical oxygen demand (BOD) with microbial sensor JIS K 3602-1990 (established Sept.1, 1990) although the BOD (JIS K 3602) microbe electrode method and BOD5 (JIS K 102) 5-day method are different, the expected BOD5 value can be approximated from the BOD value. This enables water quality to be monitored over a short period of time in order to permit any necessary measures to be enacted as separate standard.